← Today’s watercolor: The Snake Bucket Challenge! One of my absolute favorite things about Japan is the profusion of shaved ice in the summer time. From the Dom Pérignon shaved ice at the Grand Prince Takanawa (it’ll set you back a cool ¥30,000, or about $300, but it serves seven!) to the surprisingly passable ¥134 special at the 7-11, there’s options to satisfy every craving. fashion-crazed humanity of Takeshita Dori, United Arrows is a chic clothing store located just across the street from the Harajuku outpost of one of my favorite coffee companies, Streamer Coffee. Well, technically it’s on both sides of the street, but the tea shop is located in the women’s clothing building to the north. When you walk in, you’ll probably first notice the gargantuan line, a sure sign in Tokyo that something must be good if it’s worth waiting for. The next thing I noticed was the ceramic mochi grill on every table. The menu boasts a number of traditional sweets, and I look forward to trying their red bean soup with grilled mochi, as soon as the weather cools off. The decor is lovely, hitting that perfect note of modernity and tradition. 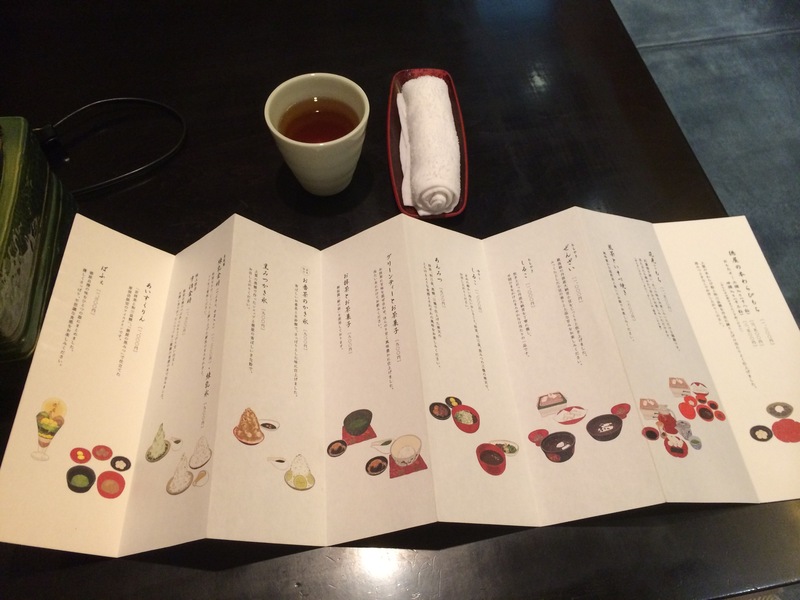 The menu itself even caught my eye, with lovely illustrations of the offerings on hand. The scent of money hangs lightly in the air, but the crowd seems to cover a large range of Tokyoites, young and old. I didn’t feel too underdressed in my Uniqlo shorts. 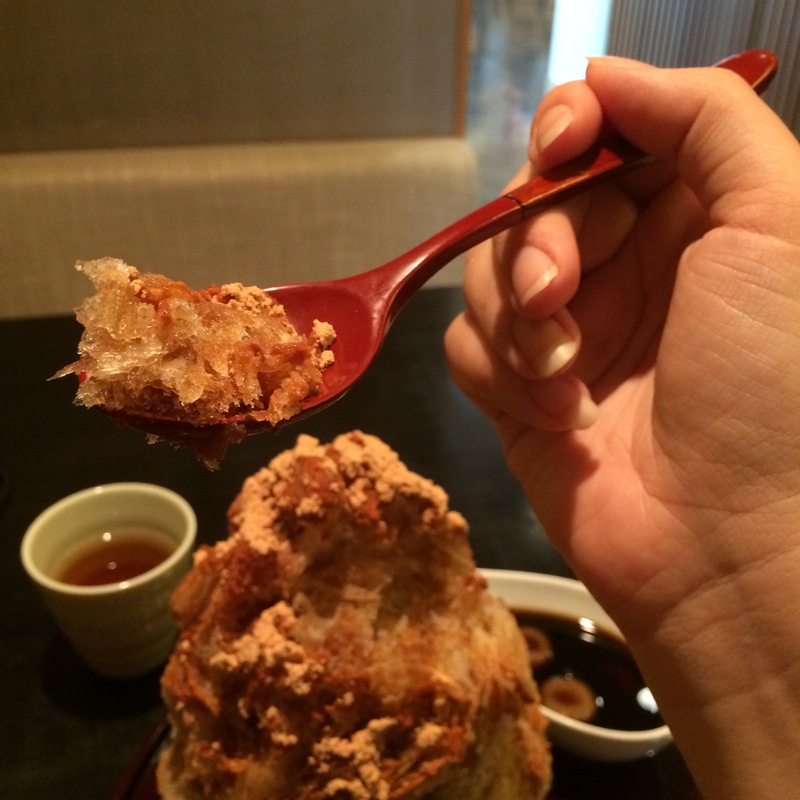 I chose the 黒みつかき氷, or brown sugar shaved ice. I usually prefer choices with condensed milk, but this is not a place with a lot of customization options. That being said, the great mound of ice and syrup was liberally dusted with きな粉, or roasted soy bean powder, which provided a nutty richness to the whole affair. There was also a little dish of extra syrup with three chewy dango as well. The brown sugar paired wonderfully with the kinako powder, and the mochi dumplings added a nice element of variety in both texture and flavor. The only fault I found was that their ice was not shaved as finely as the shops in my hometown–maybe I’m spoiled, but the thinness of the ice does really make a difference! 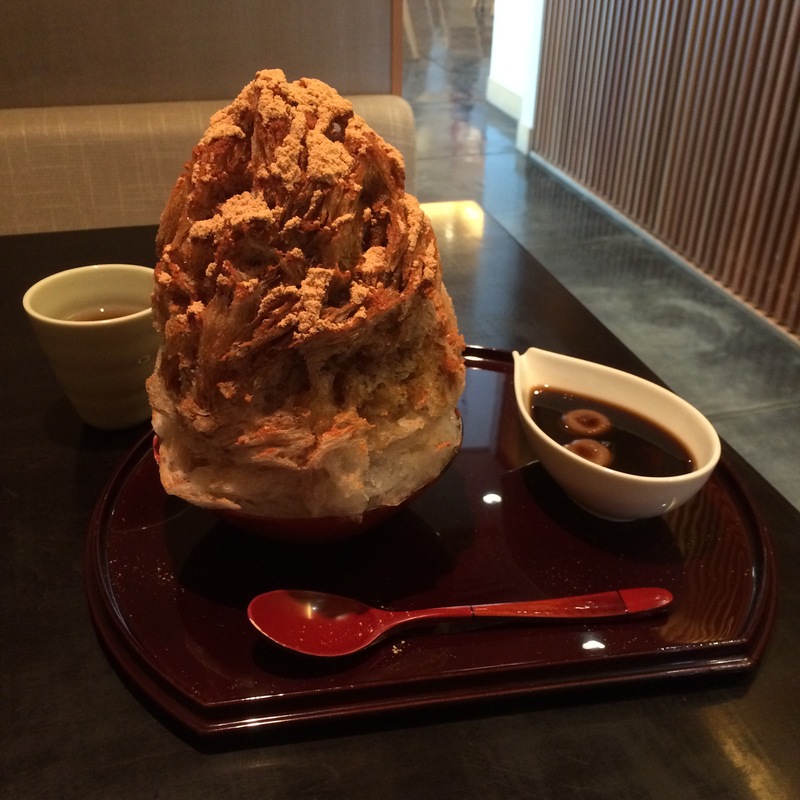 Still, if you’re looking for a traditional feeling with a nice blend of modernity and money (the shave ice was a little on the high side at ¥950, but for Tokyo that seems fairly reasonable–after looking at the Dom Pérignon shaved ice, it seems like a steal! ), then this is the place for you! This entry was posted in Food!, Japan, Modern Traditions, Uncategorized and tagged brown sugar, coffee, dango, Harajuku, Japan, Japanese food, kakigori, kinako, mochi, shaved ice, streamer, summer, Tokyo, united arrows. Bookmark the permalink.